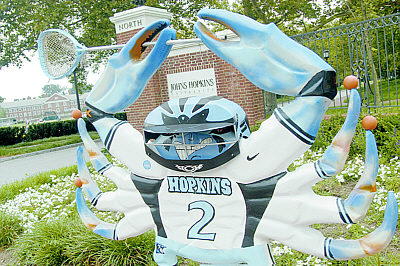 'LAX Crab' proudly wears the team jersey of the NCAA national lacrosse champions. The sculpture is the work of Julia Andersen and Catonsville High School students. Everyone, it seems, has his or her favorite among the more than 170 artistically decorated crustaceans crawling all over Baltimore this summer. There's Crab Cake (a candle-holding birthday cupcake), Crab Calloway (sporting a tuxedo), Taxi Crab (bright yellow, natch) and — for Johns Hopkins fans — LAX Crab. Guarding the North Gate to the Homewood campus, the menacing fellow holds a lacrosse stick overhead and wears a bold No. 2 jersey, just like Blue Jays goalie Jesse Schwartzman's. Created by artist Julia Andersen and Catonsville High School art students, LAX Crab was sponsored by JHU's Interfraternity Council, Panhellenic Council, President's Office, Athletics Department and Office of Greek Life. Andersen asked to feature a No. 2 jersey because she was such a fan of Schwartzman's performance in the NCAA championship finals. The Crabtown Project is a combination public art and fund-raising/public awareness project of Baltimore's Believe in Our Schools campaign, which supports facility improvements. Funds are being raised through sponsorships, direct contributions and an auction of the sculptures, which will be held in November. Guilford Elementary/Middle is Johns Hopkins' school partner in the program. GO TO AUGUST 8, 2005 TABLE OF CONTENTS.